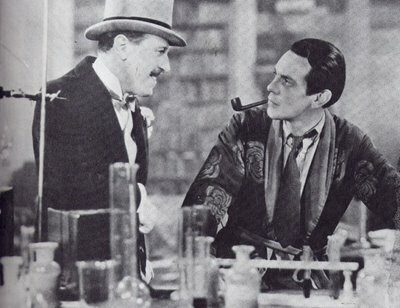 Raymond Massey takes on the role of Sherlock Holmes in this early movie. Sherlock is a little bit different here having an office with three secretaries and a computer like device. The movie opens up with Violet Stoner deciding to quickly marry her fiance who is being called away with work for a year. She was going to inherit money from her parent's estate, but she dies before the marriage can take place. Her last words were "The Speckled Band." Violet's sister Helen has now become engaged and she begins to fear her step-father, Dr. Rylott. When he tries to make her sleep in her sister's room, she goes to Sherlock Holmes for help. When Sherlock comes to the estate he examines the room and finds some strange things going on. The movie sticks pretty close to the original Arthur Conan Doyle story, and is pretty well done. Gypsies, India, and snakes all make their way in to the movie. This was Raymond Massey's first credited film and he did very well. It's a shame he didn't get another chance to play him later in his career. The film quality of the movie wasn't too good. Sherlock Holmes: From your clothes I would deduce - you're going to a wedding. Dr. John Watson: At last I've got you. For once in your life you're wromg. Dr. John Watson: I'm not going to a wedding! I'm coming from one! Sherlock Holmes: Give them my congratulations or perhaps condolences. Dr. John Watson: Rubbish! We all come to it, my dear fellow. Dr. John Watson: [he laughs again] We all come to it. Goodbye. Sherlock Holmes: [alone after Watson has left] Not all, my dear Watson... not all.